Paper Size: 26.25" x 19.75"
The venerable DC-3 lifts off a runway in America’s heartland, heading toward yet another destination. By the beginning of WWII the U.S. was well covered by a web of airline routes that linked all major cities. 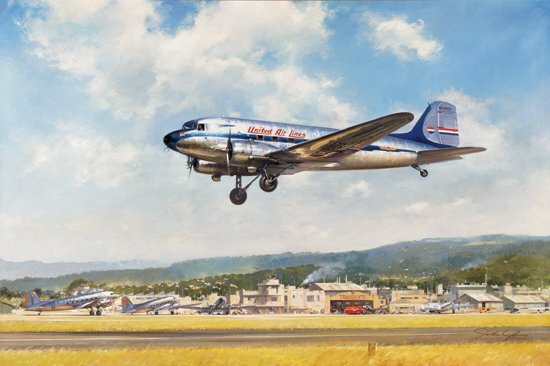 Air travel was becoming an essential part of American life and DC-3s could be seen arriving and taking off from almost every city across the country. Over 10,000 DC-3s, and their military equivalent, were manufactured. After the war many went back to their original jobs, moving passengers and cargo.